The eyes are the window to the soul so let us enhance your most important feature. We use a combination of waxing, tweezing, combing, cutting & tinting to achieve the perfect eyebrow shape, colour & definition – this is true eyebrow artistry! LVL Lashes have created a storm in the beauty world by straightening rather than curling eyelashes to give you a fabulous wide-awake appeal that is completely natural AND yours! This innovative new treatment will lend a remarkable amount of length, volume & uplift to your very own eyelashes without harming the fine hairs. 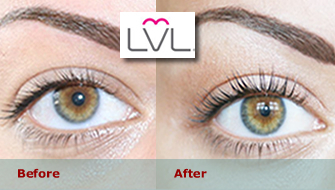 The LVL treatment takes 1 hour & lasts for 6-8 weeks, depending on the length & quality of your natural lashes.